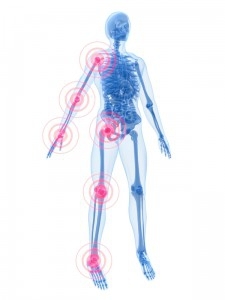 Arthritis is a broad term, basically meaning joint pain. As a result it is a common complaint presented to chiropractors. Many people don't realize that there are over 200 different types of arthritis affecting any age group and any joint in the body. The most predominant that I personally see is osteoarthritis also known as wear and tear or degeneration. During treatment I often find simple advice regarding things like diet and exercise, as detailed in this article, can have a profound effect on my patients' quality of life. There have been no definitive links between given food groups and inflammatory flare ups, although certain foods are known to reduce pain and inflammation, including; apples, berries, cherries and citric foods. Certain types of arthritis such as Rheumatoid Arthritis, long term steroid intake and/or inactivity can lead to bone density issues so it's important to get Calcium and vitamin D from dairy products and leafy greens like spinach, kale and broccoli. Essential fatty acids (EFAs) can help some people with arthritis. Including; Omega 3 and Omega 6, usually found in oily fish, nuts, meat and cheese. (Beware, Omega 6 may be linked to an increase in inflammation). Popular supplements include glucosamine chondroitin, Aloe Vera and Evening Primrose Oil. Always check with your health care provider if on medication before taking these. Control your weight; less weight means less pressure on aching joints. Combat morning stiffness by taking time to mobilise joints. Draw circles with your neck, shoulders, wrists, pelvis and ankles. You can also try lying on your back and bringing your knee to your chest. This is a gentle way to improve motion. Fitness in the pool is another way to gently improve function. If you don't like swimming there are many Aquafit and Aqua Zumba classes. Strength training - you don't have to be lifting heavy weights, resistive bands will often suffice. Remember that with inactivity comes osteoporosis, so use it or lose it! My patients who suffer with Osteoarthritis or cervical spondylosis often report increased mobility and less pain when undergoing chiropractic treatment. Those who adopt the lifestyle changes relating to diet and exercise understand it is a way of life and not a one off stretch or supplement. Take control of your health today and make some positive changes.